Raven also showed the Chilkat people the first seeds of the Indian tobacco and taught them to plant it. After it was grown up, he gathered clam shells, roasted them until they were very soft, and pounded them up with the tobacco. From ancient times the Tlingit cultivated indigenous tobacco. They ground it in stone mortars, mixed it with wood ash and lime, and worked it into spruce gum pellets to place between gum and cheek. After Western contact Tlingit carvers made crest pipes for smoking imported tobacco. 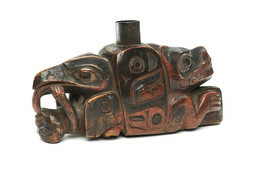 This pipe depicts a bear on one end and on the other an eagle transferring spiritual power to a person through its tongue; both animals are symbols of the Kaagwaantaan, an Eagle clan. The bowl is a section of gun barrel.